Photo: Valerie Marino Beijing roasted duck in a steamed bun with hoisin sauce in China. Photo: Valerie Marino Pot stickers in China. Photo: Valerie Marino Heather McPherson, Pam Brandon, and Katie Farmand demonstrated a dish from their cookbook Good Catch: Recipes and Stories Celebrating the Best of Florida's Waters, during a ticketed event in the Festival Center. The trio cooked lobster creole, a recipe originated at Garcia’s Seafood Grille & Fish Market in Miami, and answered questions from the audience about cooking seafood at home. Photo: Valerie Marino Mango bubble tea in China. Photo: Valerie Marino Buttered chicken with naan and Ethiopian berbere-style beef tenderloin with pap from the Africa booth. Photo: Valerie Marino Chocolate baklava in Morocco. Photo: Valerie Marino Spicy hummus fries with tzatziki sauce in Morocco. Photo: Valerie Marino Locals flood the World Showcase on weekends, so visit on a weekday for much shorter lines. Photo: Valerie Marino The Festival Center is home to Back to Basics seminars for tips and tricks from cooking pros, a wine shop, cooking demonstrations, book signings, and more. Photo: Valerie Marino The Chew Collective booth features items inspired by ABC’s daytime talk show, including ricotta and zucchini ravioli and a peanut butter and white chocolate mousse. Photo: Valerie Marino This area near the Greenhouse Guru booth gives information on growing food in greenhouses, different types of irrigation, and natural pest control. Photo: Valerie Marino Liquid nitro chocolate-almond truffle with warm whiskey-caramel from the Chocolate Studio. Photo: Valerie Marino Islands of the Caribbean, new to the festival this year, features dishes from Jamaica, Cuba, and more, along with a frozen mojito, Caribbean sangria and Presidente Pilsner on tap. Photo: Valerie Marino Mojo pork with black beans, cilantro rice, and pickled red onion from Islands of the Caribbean. Photo: Valerie Marino Picking up a cup of this cheddar cheese soup, served with a pretzel roll, at the Canada booth is much easier (and more affordable) than a reservation at Epcot’s Le Cellier Steakhouse. Photo: Valerie Marino Fresh potato pancake with Scottish salmon and herbed sour cream in Scotland. Photo: Valerie Marino Beer-braised beef with smoked Gouda mashed potatoes, alongside Stella Artois Hard Cider in Belgium. Photo: Valerie Marino Smoked beef brisket and pimento cheese on griddled garlic toast from Hops & Barley in The American Adventure. Photo: Valerie Marino Mickey Mouse grills up some veggie kabobs in a nod to the spring Flower & Garden Festival at Epcot, which features dozens of topiaries. Photo: Valerie Marino Loaded mac and cheese with Wyder’s Dry Pear Hard Cider from the Farm Fresh booth. Photo: Valerie Marino Kalua pork slider with sweet and sour pineapple chutney and spicy mayo from Hawaii. Photo: Valerie Marino Epcot’s Odyssey Center served up six different craft beers from around Florida. This flight includes the Concrete Beach Stiltsville Pilsner, 3 Daughters Bimini Twist IPA and Shipyard Midnight Snack Milk Stout. Photo: Valerie Marino The Brazil marketplace, serving escondidinho de carne with mashed yucca, pork belly with black beans, and Brazilian cheese bread, is one of many locations representing countries not usually seen around Epcot’s World Showcase. 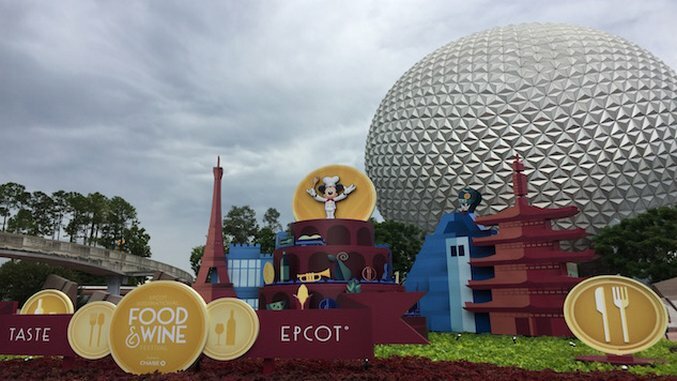 The Epcot International Food & Wine Festival is in full swing at Walt Disney World in Orlando, with foodies flocking to the theme park to sample cuisines from around the globe. Now in its 21st year, the festival boasts more than 30 marketplace booths representing both countries, like Poland and New Zealand, and broader themes, like the Chocolate Studio and Farm Fresh booths. Cooking demonstrations, beverage seminars, events with celebrity chefs and a concert series round out the schedule and give festival goers a break from eating their way around the World Showcase promenade. Nearly half of the food and drink offerings are new this year, with Epcot chefs working nearly year-round to test recipes and build menus. The festival is included in regular park admission (starting at $97 for a one-day ticket) and runs through Nov. 14. Be sure to pick up a Festival Passport when you arrive, which includes full food and drink menus to check off your progress.